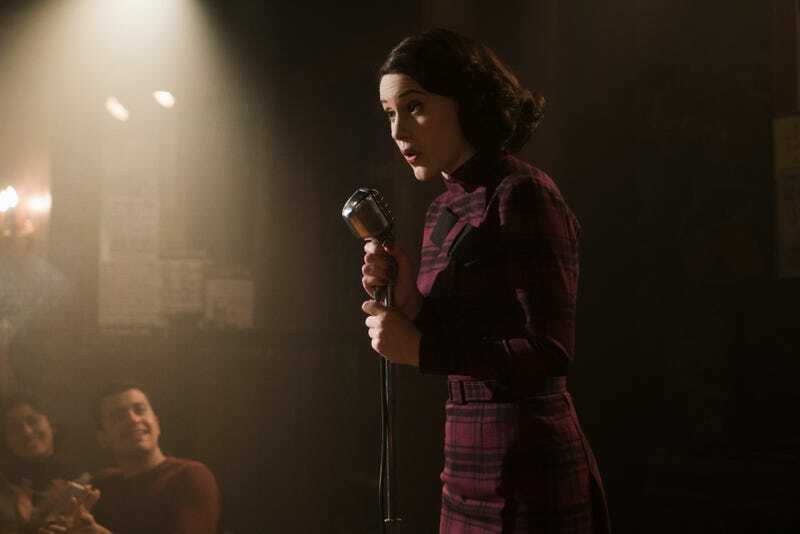 The pilot of The Marvelous Mrs. Maisel starts with a delightfully offbeat wedding toast and ends with Midge Maisel bailing Lenny Bruce out of jail after performing a scandalous comedy routine that led her to a similar fate. Though episode two picks up at the moment we left off, with Midge asking Lenny his reasons for pursuing comedy, “Ya Shivu v Bolshom Dome Na Kholme” is a subtler exploration of Midge’s grief, as she sobers up from her Yom Kippur Manischewitz binge and begins to come to terms with the reality of her situation: that Joel, her husband of four years, is a complete schmuck who steals other people’s comic routines, is having an affair with his doltish secretary, and is the kind of guy who decides to pack a suitcase and leave his marriage after one particularly bad stand-up routine. For all her ebullience, Midge is, above all else, a woman who values being in control—from her insistence on sneaking out of bed to remove her make-up only after her husband has fallen asleep, and waking up before their alarm goes off to put on her same perfect face, to her obsessive need to measure her ankles, calves, hips, waist, and bust on a daily basis. Certainly, some of Midge’s choices can be ascribed to the time period, but given a choice between a downtown bohemian life and living in a posh apartment with a doorman, Midge selects a life of respectable comfort over dizzying freedom. True to form, after her initial drunken foray into stand-up, Midge attempts to regain control over her life by going to her regularly scheduled dance class, which, hilariously, doesn’t look all that different from today’s barre classes, filled with wealthy ladies in fancy workout clothes, twisting, spinning, leg lifting, and working out the core. Back when Mad Men was on the air, many viewers reveled in a strange kind of nostalgia for the style and sensibilities of an older era. Folks hosted Mad Men themed parties and ladies debated whether they were a Joan or a Peggy. Don Draper’s macho swagger was written about lovingly, even as he seduced and/or harassed female coworkers and constantly cheated on his icy wife. Perhaps back in 2007, many viewers felt safely held in a “post-feminist” world where we could look back on the olden days of retro sexism and simply laugh. No more: It’s 2017 and we are very well aware that the sexism of yore is just as palpable today as ever, with more and more men in the public eye being accused of sexual misconduct, harassment, and assault, and more and more women coming forward with stories about the ways they’ve been impacted by sexism and misogyny. The world of Mrs. Maisel may be cheerfully retro, but it’s also painfully current in how it explores a world where women’s emotional needs are secondary to keeping up appearances. In exercise class, Midge’s friend implores her to control the narrative so that she doesn’t end up like one of sad divorces in the back of dance class getting ready to die alone. When Midge’s parents learn of her impending separation, her mother visits a fortune teller who reads her tea leaves and offers a lucky “keep your husband” charm to place under Midge’s pillow, while her father implores his daughter to “put on a nice face” and attempt to win her petulant husband back. Perhaps most embarrassingly, her father-in-law laments that without Joel, Midge will be reduced to spending the rest of her life playing jigsaw puzzles alone (oy vey!). “I don’t want him here if he doesn’t want to be here” she tells her frantic parents, who believe that saving Midge’s marriage will prevent her from becoming a social pariah. It’s a powerful moment, but it’s hard for Midge to hold onto it. “Are you really going back to school?” her father asks. “No,” Midge mumbles, looking away. “What will you do?” he asks and when she doesn’t say anything, he hands her some money and walks away, as his daughter looks at the unearned cash and slowly, quietly collapses into tears. It’s clear that Midge realizes it’s patently unfair that she is seen as pitiful, even though all evidence points to the fact that her husband is a complete loser, a philanderer who isn’t able to offer either emotional or financial support to his family. When her father-in-law threatens to evict both she and Joel from their apartment, Midge does what any damsel-who-saves-herself would do and absconds to the comedy club, much to the delight of aspiring manager Susie who spent much of the episode trying to coax her into pursuing a stand-up career. At the end of episode two, Midge loudly reveals to a delighted audience that she no longer lives in the large house on the hill, a phrase from one of the Russian books she read in college, a statement that is clearly both sordid confession and an empowerment manifesto. In the gym, on the street, in her home, Midge may be a masterful performer of femininity, but it’s on the stage, in the spotlight, with a microphone in her hand, that our rebellious heroine is suddenly, magically, marvelously alive. I was disturbed by the way that Susie literally pushes a black female poet off the stage in order to make way for Midge—would a male comic, or a white female performer have been kicked off in this same manner? Was this a deliberate critique of white feminism? Or just a tone-deaf moment? I sincerely hope that racism doesn’t go unexamined in this series. I want to go to Midge’s exercise class. I’m trying to think of how that class would be sold today: sailor aerobics? That entire scene was perfect, from the dialogue, to the workout routine, to everyone’s cute little handbag set on a couch in the back of the room. Also, did people really use a glass bottle as a workout prop? This seems like something people could potentially buy on Etsy. Speaking of which, that cupcake that Midge offers Susie when she first visits the apartment is quite adorable, and Midge’s dress is an absolute showstopper. The late 50s has never looked so lively and fun.